KT Corp. will launch the long-awaited Long Term Evolution service on Tuesday, rekindling competition for faster smartphone services among local telecom carriers. KT said it aims to secure 4 million LTE subscribers within the year by completing nationwide coverage in 84 cities by April, the same level of coverage as market leader SK Telecom, which started the service in July. “The company’s LTE launch has been delayed for more than a month. 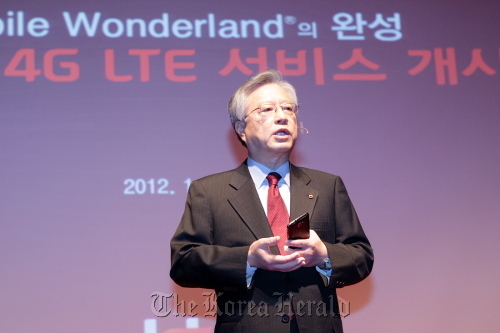 Despite our late start, we will introduce a more complete LTE service,” said KT chairman Lee Suk-chae during a press conference. A court ruling last week gave the green light for KT to ditch 2G services in order to use the 1.8 GHz band for 4G LTE services. For a faster and more stable service, KT said, it has developed a new cloud communication technology called “Warp,” in which up to 144 base stations are operated under one virtual station. The system controls the blind spot for network service and assigns data capacities depending on the Internet traffic around specific areas, the company explained. “The system is easier and faster to be installed. In April, 92 percent of the nation’s total population will be offered quality LTE services,” Lee said. According to a June report by the Economist magazine, Korea topped the world’s data guzzler list last year, with its Internet traffic almost tripling second-placed France. The trend was also expected to continue in 2015. KT explained it has come up with some safety measures preventing “bill shock” such as an additional 20 percent data capacity for the first three months and an automatic data shutdown when the usage limit runs out. Under LTE bill plans, the company also offers voice call services for almost free of charge as up to 1,000 extra minutes are given for heavy data users.